Janine Jackson interviewed Rebecca Vallas about Trump’s attack on Medicaid for the January 18, 2019, episode of CounterSpin. This is a lightly edited transcript. Janine Jackson: Recent reporting by Politico, citing three administration sources, says that the Trump White House, having failed to get congressional support for the capping and shrinking of federal Medicaid spending, now plans to try to make those changes without congressional approval. 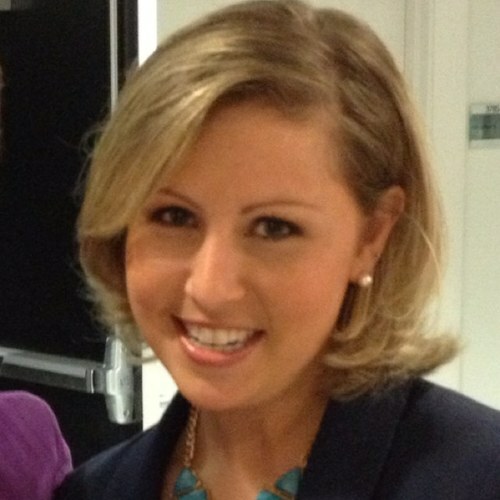 Rebecca Vallas: Thanks so much for having me back. 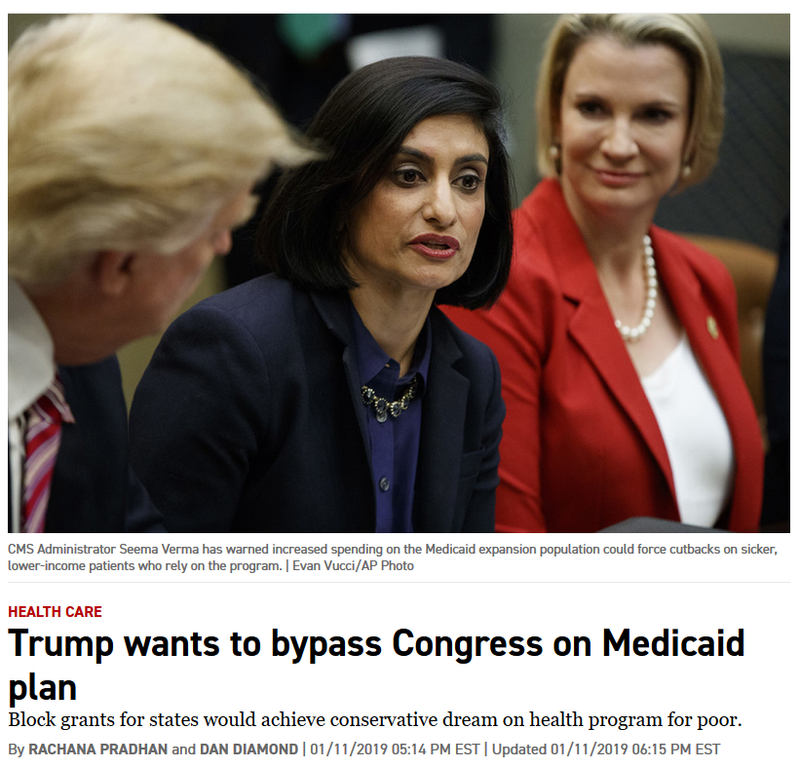 JJ: This is a disturbing new tactic, trying to ram through the dismantling of Medicaid by some sort of executive action, but proponents of that dismantling—which now include Seema Verma, administrator of what’s called the Centers for Medicare and Medicaid Service—their argument, or the one they say out loud, anyway, seems basically unchanged. So maybe we should start with addressing the idea, that folks will have seen in media coverage, that capping federal Medicaid spending, converting it to block grants, would give states more flexibility in how they administer the program. RV: So Janine, I’m really appreciative that you started there, because I feel like “block grant” is one of those jargon terms that gets thrown around in the halls of the Capitol in Washington, DC, but it needs to be decoded a little bit for folks to really take it and understand what it means in English. So “block grant” is code for converting a program from one that guarantees coverage to everyone who qualifies—that is currently the way that Medicaid works—to a program that helps fewer and fewer eligible people over time, because it involves capping that program’s funding in a way that declines year after year. Currently, Medicaid is a federal/state program. That means it’s partially funded by the feds, it’s partially funded by the states. The feds pick up a set percentage of states’ Medicaid costs. And what a block grant would do to the Medicaid program is to cap the amount of federal funds that states get, giving them a fixed dollar amount, and then requiring them to pick up the rest. So effectively, block-granting is a backdoor strategy for making really, really deep cuts to a program, in this case Medicaid, in a way that’s intentionally designed to make those cuts grow deeper every single year. And your listeners will not be surprised to hear that what that means, in the case of Medicaid, is lots and lots of people losing their health insurance. JJ: And there’s research on this. This is not speculation. We know what block grants actually turn out to mean when they’re put into place. RV: That’s exactly right, and this is definitely not a new idea. As you said, it goes all the way back to former speaker Paul Ryan’s kegger days: He told us that one of his dreams in Congress was to dismantle Medicaid by block-granting it. But analysis of a recent proposal similar to this, that House Republicans had included as part of the recent healthcare fight, where they were trying to repeal the Affordable Care Act, but also trying to dismantle Medicaid, that was a big part of that fight, too: Analysis of a proposal that Republicans had put forth to block-grant Medicaid, and this comes to us from the Urban Institute, it estimated that between 14 million and 21 million Americans would have lost Medicaid if that proposal had taken effect. So that is the kind of policy that we’re watching this White House continue to try to champion, despite the fact that the American people stood up and loudly rejected the White House’s, and Republicans in Congress’s, attempt to take health insurance away from tens of millions of Americans, including through their attempts that failed to dismantle Medicaid through legislation. And part of the reason I’m connecting the current proposal from this administration to the healthcare fight of 2017, and to some extent 2018, is because this is exactly the kind of playbook we have seen this White House take to. When Trump doesn’t get his cruel agenda through Congress, he turns around and takes matters into his own hands, and tries to see how much damage he can do to programs that help low-income folks, like Medicaid, by fiat. So that’s what he’s doing here; he’s trying to sidestep Congress, and take health insurance away from potentially tens of millions of Americans, unilaterally. And people with disabilities would be especially hard hit or impacted by these sorts of changes, wouldn’t they? RV: That’s exactly right. People with disabilities are really one of the groups who would be hurt the most if Medicaid were dismantled by a block grant proposal like this. And that’s because, for many people with disabilities and folks with severe health conditions, Medicaid isn’t just health insurance. It’s also home- and community-based services. I’m talking here about personal attendant care, skilled nursing, the kind of stuff that makes it possible for millions of people with disabilities to live independently, to remain in their homes, instead of being forced into institutions to receive the kind of care and services that they need. So loss of Medicaid would push people with disabilities, potentially, into institutions in droves, but it would also—and this is sort of a secondary point, that doesn’t get a lot of attention in the healthcare context—loss of Medicaid would also push lots of people with disabilities out of the workforce. And that’s because those home- and community-based services I was just talking about don’t just enable people with disabilities to live independently, in many cases, but also to work outside the home. And that’s really what’s at stake here for folks with disabilities, not just loss of needed care that allows them to remain healthy, but also independence at its core. JJ: That was one of the points that you made in a very well-received and useful Twitter thread, and it really struck me, because it just adds additional weirdness to the fact that people continue to trot out this line that public assistance is about lulling people into laziness and so on. And we’re really talking about a change that would have the effect of making it impossible for some people to work in the way that they have been doing. RV: We’ve also seen now a growing body of research telling us that Medicaid expansion is actually a huge pro-work strategy, because when people are healthier—maybe this doesn’t come as quite a shock to your listeners—but when people are healthier, they’re better able to work. They have higher earnings. They have higher labor force participation. So this administration has really been doing everything it can to try to dress up its cruel cut-cut-cut agenda with puppies-and-rainbows language that makes it sound like it’s all in service of work. But this is actually a massively counterproductive strategy, if the goal is actually work, and we know it’s not. JJ: You also note in that thread that it isn’t only people who lose insurance who can be harmed, because states that are pushed to cut costs will find other ways to do that, like throwing up hoops, or making it harder to get medicines and services. But for those who could and would lose insurance, that means we should really think about harms, up to and including death, including people dying, right? RV: Now, Republicans in Congress really don’t like when people make the point that you just made, about how when you take healthcare away from people, people die, and lives are literally on the line. But that’s not histrionic, that’s reality, unfortunately, here. I’m going to put some numbers to this, for anyone who thinks that that’s overblown or histrionic, like some of the proponents of these cuts have claimed that they are. The Congressional Budget Office, back in 2017, taking a look at some of those Republican healthcare repeal plans, they estimated that more than 200,000 so-called unnecessary deaths—literally, people dying who otherwise would not have—would occur by 2026 if the Senate Republican healthcare repeal plan had taken health insurance away from tens of millions of Americans, as it would have. So that’s what’s at stake here, is literally people’s lives that are on the line if this kind of a policy takes effect. But on the flip side of the coin, we know that expanding Medicaid actually saves lives, and some analysis from the Center for American Progress finds that if all of the states, the 14 states that still are refusing to adopt Medicaid expansion, did expand the program, we would save over 100,000 lives just over the coming decade. So we know what to do from a policy perspective, if what we’re trying to do is to make sure we have a healthy population and workforce. But this agenda that is still being pursued by the Trump administration, to take health insurance away from as many people as possible, even without the blessing of Congress, now that they failed to get it—it literally is an agenda that will kill people. JJ: Let me just say, finally, as you’ve noted, the people have spoken on this, repeatedly; they want no part of it. They prefer Medicaid to expand rather than shrink—I mean, go figure, folks just aren’t in favor of cutting the safety net. What’s your sense of what the administration has the power to do here? And what can we do? RV: You are exactly right that legal advocates wasted no time in taking a look at this, and voicing their very strong read that Trump does not have the legal authority to block-grant Medicaid through administrative action; this is something that would take an act of Congress. So lawsuits are inevitably going to follow if the administration does move forward with this plan. And at the same time, the newly Democratic-controlled House will for sure try to block this cruel move. House Democrats have already vowed to investigate the Trump administration’s healthcare sabotage. This is part and parcel of that ongoing sabotage effort. And as you said, Senate Democrats as well, even though they’re not in control of that chamber, will be important voices in this debate as well. But I want to just leave people with the note that even though we’re still waiting to see where things go from here, what exactly the proposal looks like out of this administration, it wouldn’t hurt to call your member of Congress and let them know what you think, especially now that House Democrats are poised to be a check on Trump. And we know where the American people stand on this. Polling by the Center for American Progress last year found that 80 percent of Americans oppose cutting Medicaid. The American people loudly and clearly said “no” when Republicans in Congress and the Trump administration tried to dismantle this popular program as part of their healthcare repeal efforts. And that is exactly why we’re seeing the Trump administration try to go around Congress and do this unilaterally, because they know it’s not something that the American people would allow to happen if it were done in the light of day. JJ: We’ve been speaking with Rebecca Vallas, vice president of the Poverty to Prosperity program at the Center for American Progress, host of the podcast Off-Kilter. She’s on Twitter at @rebeccavallas. Rebecca Vallas, thanks so much for joining us this week on CounterSpin. RV: Thanks so much, Janine.